Only the name Legendary can describe this luxurious mountain home! Legendary View Lodge is located in the community called “Mountain High” and the views from the top of the mountain do not disappoint. 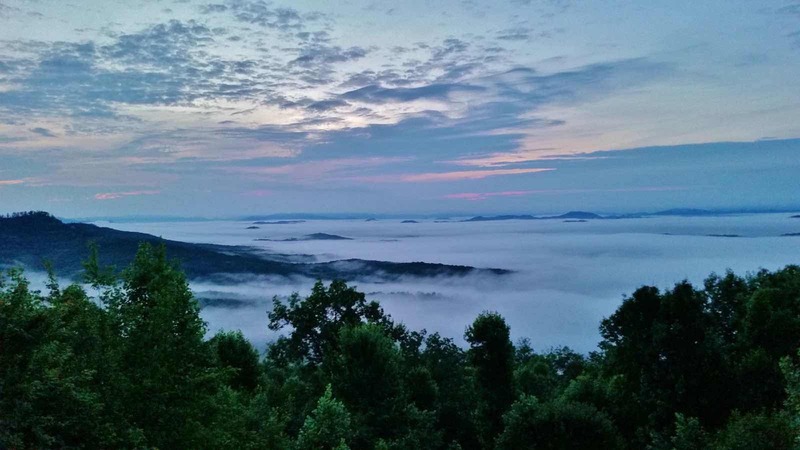 Only about 20 minutes from Downtown Blue Ridge, Legendary View Lodge is a gorgeous and spacious cabin on all paved roads. Step onto the main level wrap around deck to access the front door which will reveal a professionally decorated luxury mountain home. The kitchen, dining room and main level living space flows together for a roomy open floor plan with plenty of windows emphasizing the breathtaking view. Granite countertops in the kitchen provide ample space for preparing meals. A beautiful hand-crafted dining table with two chairs and log benches on the sides can seat at least 6 guests. The living space has soaring ceilings, a stone gas log fireplace, unique Native American décor & artifacts, luxurious sofas and a natural bark log coffee table, and a 46 inch flat screen HDTV. Just a few steps from the kitchen is the main level’s half bath and laundry room. Proceed out onto the main level deck to the unique whiskey barrel table, perfect for outdoor dining or maybe even a glass of Jack Daniel’s to accompany the whiskey barrel! From this east-facing deck, the awe-inspiring view is ideal for those early risers in your party who want to enjoy a spectacular sunrise! Kick back in one of the rocking chairs and enjoy your coffee as the fog lifts from the endless rolling mountains each morning. 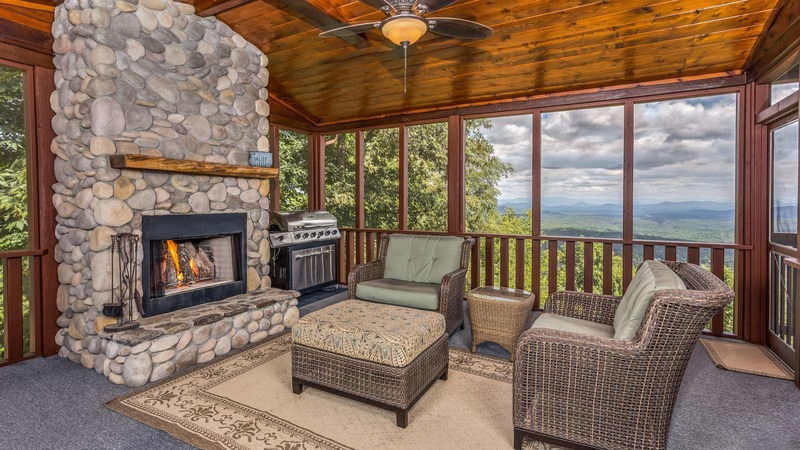 Immediately adjacent is the screened-in outdoor porch with a gas grill and a stone wood-burning fireplace. The porch provides plenty of seating and space for enjoying the fire and grilling with friends and family. Come back inside to explore the rest of the cabin including the main level bedroom which has double glass doors opening onto the main deck and the spectacular mountain views. The main floor master bedroom offers a king size bed, 32 inch flat screen HDTV, and a private bathroom with double vanities and standard shower. From the main room, journey up the log staircase to the upstairs master bedroom! The master on the upper level has a king size log bed, 32 inch flat screen HDTV, and a private bathroom with a tile shower, jetted garden tub & double vanities. 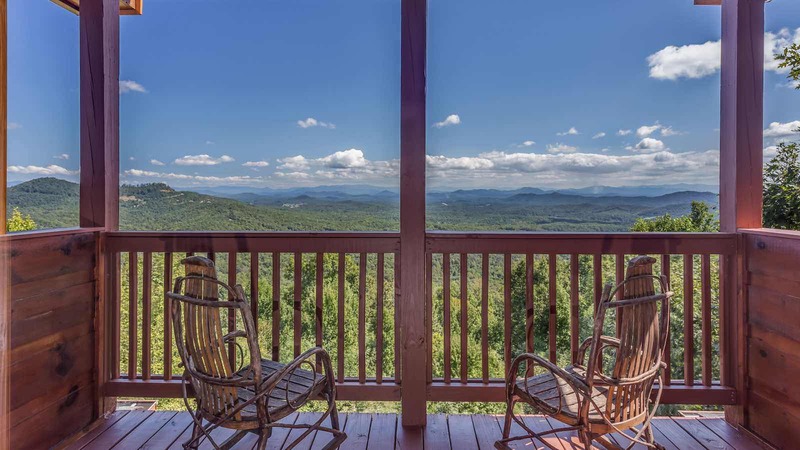 The upstairs master also boasts a private balcony with hand-crafted rocking chairs and more spectacular mountain views. Ready for a game of pool? Head downstairs to the game room level with the 2nd living space area. On this level you will find a pool table, a large 54 inch flat screen HDTV, sofa seating, and the 3rd bedroom and bathroom. The bedroom on this level also has a king size log bed and a separate bathroom. The double glass doors on the lower level provide access to the lower deck with patio furniture and the same amazing mountain views. The deck on this level also offers a private area to the right with an in-ground hot tub. 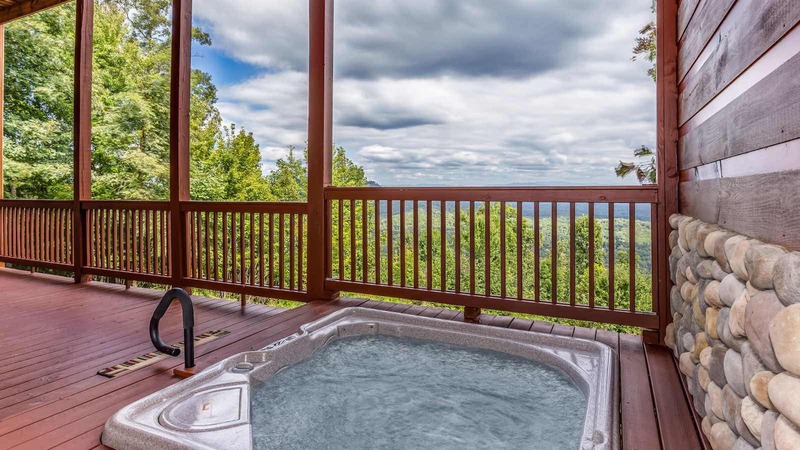 Stepping into the soothing bubbles is convenient and easy as you set the mood with a wonderful gas log fireplace immediately next to the hot tub. This is an awesome place to soak and enjoy a local wine and cheese sampler, or perhaps a glass of champagne to celebrate a wonderful vacation.